Over 14 years of evolution and innovation that has led to a great growth and success measured by internal and external bodies. SamTech has proven to be the leader in offering Turn-key solutions to our customers in the local and regional markets. March 22nd marks SamTech first internal corporate meeting with all 44 of our team members attending it. The meeting was very motivating because of your engagement and valuable interactions. 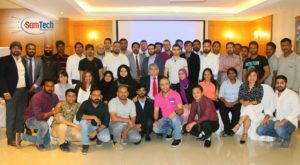 It started with SamTech latest video, then an opening note that was delivered by Mr. Samir Ibrahim Abdul Hadi our Founder & CEO sharing his journey since he started SamTech and concluded with the company’s plans for 2018. It was followed with the HoD’s plans, and ended it with Q&A session. I would like to thank you again, all of you, for joining this remarkable journey, and as Mr. Samir said in his closing note, “Without your hard work, commitment and belief in this vision we wouldn’t have made it and achieved our goals. Thank you“.